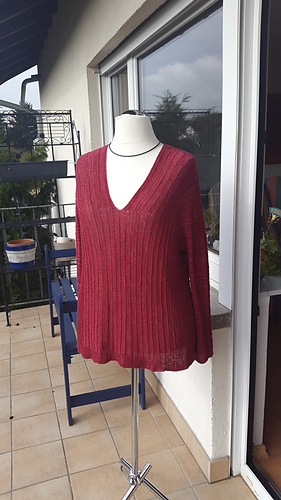 Nigella is a slightly over-sized V-neck sweater. 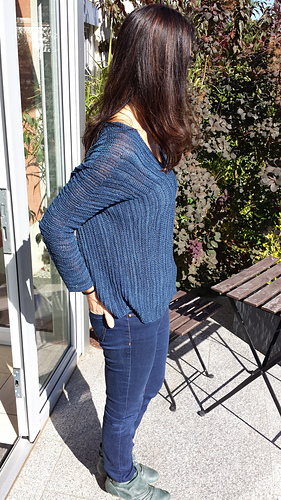 This modern sweater is knit seamlessly sideways. It combines garter details with two kinds of ridge patterns. It is knit with a lovely linen tape yarn but will also look pretty in any woolen yarn that gives you gauge. 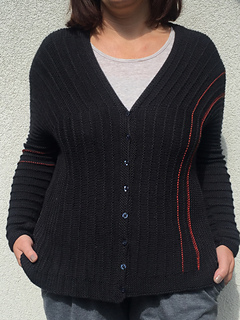 The pattern includes a description for easily turning this sweater into a stylish cardigan. Choose cute buttons and make your cardigan unique. Both cardigan and sweater will soon constitute an essential part of your wardrobe. Each knitter knits differently, therefore given yardage is an estimate. 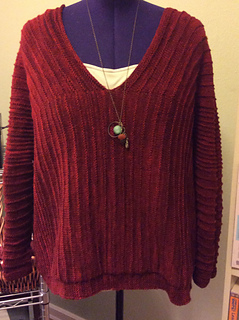 Note: This tension results from the direction the sweater is knit. Stretched stitches will add width but loose length. I highly recommend to measure your gauge before and after washing to achieve your desired fit. Linen tends to shrink when washed. Bind Off: Three-Needle-BO, Traditional BO.